Book Signing Note: Rexburg, ID- you’re our next stop! June 15th, 5pm: Deseret Book 485 N 2ND E # 104 June 16th, BYU-I Book Store 4-5 pm. My love affair with World Market started when I was just a kid. I think I was in 6th grade when my friend and I would sometimes get dropped off at the mall to hang out and we’d always walk over to World Market. They used to sell the most amazing little rose-flavored candies. Yes, roses- as in the flowers. They were so so good. To this day every time I walk into a World Market store, I keep my eye out for them. Now that I’m grown up and actually have use for the amazing household items in the store, I buy more than candy! I buy much more than candy. I love World Market like Kate loves Target. We’re talking serious business here. Some might classify it as an obsessive relationship. I mentioned in a photography post that I did a while back that a huge number of the dishes and table linens you see in my food photographs, including the photos in our cookbook, have come from World Market. They sell an amazing selection of cookware, dishes, and specialty items. Remember the adorable little mugs you all were raving about in my hot chocolate post? Yep. World Market. They also sell a great selection of furniture, housewares, gifts, jewelry, accessories (see the cute floral headband I’m wearing in the next pic? World Market! ), over 500 international wines, gourmet foods and specialty drinks imported from more than 50 countries. It’s seriously one of my most favorite places, which is why I jumped at the chance to host a party compliments of World Market and Foodbuzz. I had the perfect occasion this past weekend while I was in my home town of Seattle; my favorite sister (okay, she’s my only sister, but for reals, she’s my favorite) was having a birthday! I had a perfectly lovely backyard meal in my mind and I found everything I needed at World Market. Sometimes when you envision outdoor entertaining you immediately think of paper plates and plastic tablecloths. I love to mix and match and bring some of my indoor things out. 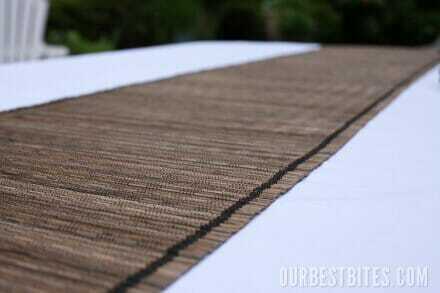 I started out with a crisp white tablecloth, and added a bamboo table runner. I love how the bamboo is kind of rustic and fits in with an outdoor theme. Then I used some plain white plates. This is a fabulous thing to have. World Market sells a lot of these buffet sets; plain white dishes in all sizes that come in these nice holders. They’re affordable, and great to have on hand for big group meals. I didn’t want them to get lost on the white tablecloth though so I used these awesome chargers. Aren’t they fantastic? This is my most favorite color so I couldn’t resist. They’re a heavy duty plastic so they’re super easy to clean too. I love these. On top of the white plates, I placed these fun melamine dessert plates. They’re light weight and inexpensive; perfect for outdoor entertaining! I love the colors in them, and found cloth napkins in a matching color too. One of my favorite things to do on an outdoor table is light candles. There’s something about a breeze, and summer weather, and flickering candles, that makes you want to stay at that table for hours. I LOVE these purple glass lanterns. Those things are big, and only 8 bucks! They matched the purple in the plates perfectly. World Market has a gazillion different styles of little votive holders. I’m madly in love with these blue square ones. I grabbed a bunch of different styles and colors and scattered them around. All the colors tied into the plates so they all matched when put together. See those cute drinks? One of my favorite things. 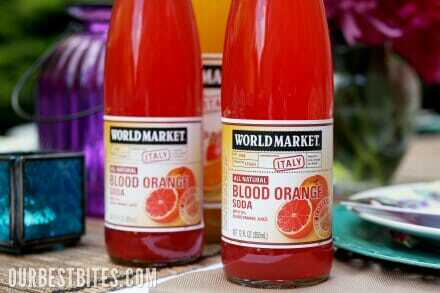 World Market Italian Sodas. They have a bunch of flavors; my family loves the Blood Orange. The Mango Passion Fruit is yummy too. The personal sized bottles look so cute on a dinner table. Sort of casual-chic. My sister bought her own flowers (okay, and she made half of this meal herself too. She’s rad like that.) How crazy beautiful are these peonies?? Seriously I couldn’t stop staring at them. I love fresh flowers on a dinner table, especially an outdoor one. Just make sure when you’re entertaining that you use shallow vases or bowls so you don’t block people’s faces. Okay I’ll stop swooning over the flowers. Back to food. 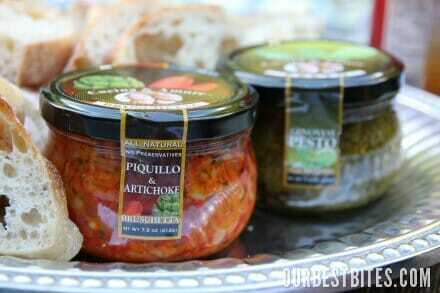 For an appetizer, I grabbed a great pesto, and also a Piquillo and Artichoke Bruschetta spread. Both were amazing. I could eat that artichoke stuff with a spoon. Okay I sort of did. Both came from World Market. Did I mention they have food there? Food from all around the world? Ya, they do. And lots and lots of chocolate and treats too. I need to make a knock-off of that artichoke spread asap. My family also loves these chips. They taste similar to those Pop Chips that are popular right now. My kiddos love ’em! They also have lots of fun trinkets, toys, and novelty items at World Market. My kids beg for stuff every time we go there and I usually say no, so this time I grabbed a bunch of toys to keep them busy while the grown-ups ate. It worked brilliantly. We also grilled up (and by we I mean my husband) one of my all-time-favorite summer meals, Italian Chicken and Vegetable Skewers. Per my sister’s request we (and by we I mean my sister) also made Caramel Toffee Fruit Dip. (Are you starting to wonder if I cooked anything at all??) And a yummy Pear and Gorgonzola Salad. 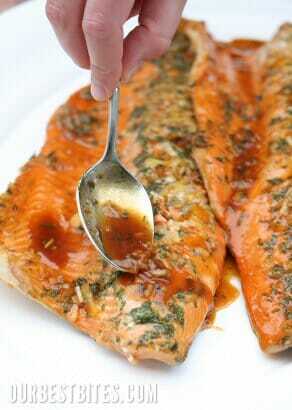 My sister also made an awesome Orange-Teriyaki Steelhead, which I’m going to share her recipe for soon! Heaven knows our Seafood Section can use all the help it can get. I’m thinking I should have her do a monthly fish feature! For dessert (seriously I made this one myself. I mean, I bought this one myself. It counts, I swear.) I picked up some Seattle-famed Trophy Cupcakes. I have to be honest and say that when it comes to gourmet cupcake shops, I’ve been disappointed way more times than I’ve been pleased. But Trophy came through! These babies were amazing. All in all it was a gorgeous night with fantastic company. Nothing better than friends and family on a beautiful summer night at a beautiful summer table! Note the only way to enter this giveaway is by leaving a comment on this post. Entries via email will not be counted. If you are reading this post in a feed service or email, click here to be directed to the post where you can leave a comment to enter. Giveaway will be open for one week, winner announced June 20, 2011. Open to US residents only. 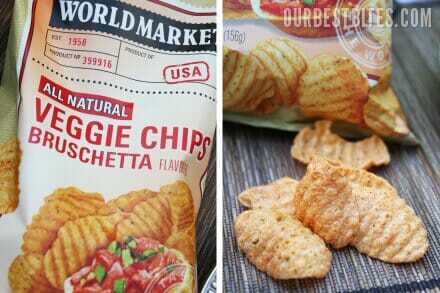 Disclosure: I received the funding for the products in this post compliments of World Market via the Foodbuzz Tastemaker Program. The opinions expressed are my own. Gift card giveaway provided by Our Best Bites. If I won the gift card, I would use it to buy awesome entertaining supplies for my new house! It’s such a fun place! I would probably use the gift card on either kitchenware or food… they have amazing goodies, and they’re so hard to resist. IF I could resist either of those departments, I’d end up getting some cute linens…which they have tons of! Seriously… one of the best stores ever! 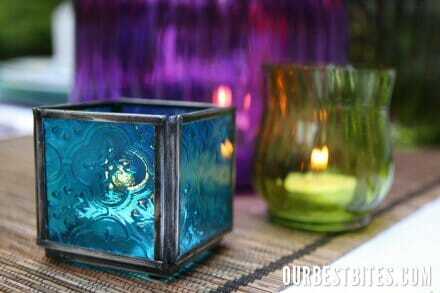 If I won a giftcard, I would spend it on votive holders. They’re so pretty! I would probably spend it on a dutch oven and some fancy plates. They have the cutest kitchen supplies! I would love to win, but I also know a few nice guys in Eastern WA where I live. Maybe she could get a group together to come this way? We’re in Tri-Cities. I don’t know how old she is, but I know plenty of very nice, LDS guys (you’re LDS, right?) in both Young Singles and Mid Singles. =) You can email me if you want to. I could use some cute new dishes! what a wonderful gift card! This would be great to give to my son and daughter-in-law that are newly married and entertaining supply challenged. They didn’t send out many invitations for their wedding so they don’t have much to spice up the table for company. I think I would purchase $100 worth of those Italian Sodas. Seriously, my mouth is watering! Ok, I’d probably buy some cite dishes, too. So many beautiful things..I found a beautful table cloth that would definitely bring summer into my kitchen..thanks for the chance to win. Love World Market! There are so many things I miss about Europe that I love to find in there. Anyway, I’d use the $100 on English candies and some fun dishes. I’d buy all sorts of new table linens for our outdoor table as well as our dining room. I’d also pick up some new picture frames too. I think I would buy some furniture. I’ve always loved all the cool stuff they carry!! I like tiny bowls and World Market has lots to choose from! I’d go for more little bowls and the Japanese candy – my kids love Japanese candy! I would love some appetizer plates, some of the snacks and chocolates…mmmmm!!! I would use it on some outdoor entertaining items, like the table cloths and plates that you showed up above. I also love their food and baskets, so it would be great to win! I’d use it on food–I love their food section. Looks like a fun place to have a shopping spree! Yeah, World Market! I have loved going there for so long! My living room curtains were the most recent purchase, and I totally love them. I think I would use the gift card to get some home decor items, I need some new curtains upstairs, and I love their selection of little decor things. Oh, and the food, yeah, I’d have to get some food too! Thanks for the giveaway! your table looks fantastic! i would spend the money on dishes and jewelry. Fun! that would be a lot of ghiradelli bittersweets! though i’m sure i’d find something else i want too! I LOVE your website! So many of my meals come from your wonderful ideas! I LOVE World Market. I was introduced to it after moving East. I would buy a little of everything.. you can’t go wrong with anything you buy there! My husband especially loves the soda in the old fashioned glass bottles. I would be tempted with their great scarves and jewelry and COFFEE, but my goal would be a new rug! I just discovered the amazingness that is World Market last month! I’d love some cute outdoor dishes, or maybe a new umbrella for the patio – they have such pretty ones! I would probably spend it on some new things for my kitchen/dining area – a table cloth, some plates, maybe some new mixing bowls. If I won the gift card, I think I would spend it on some cute summery dishes and those adorable votive holders you showed on your table setting. So cute! Love World Market too, I think I would get some new pillows for the couch and probably some chocolate and chips! I love World Market. I have purchased furniture and jewelry. Whenever I go, I never leave empty handed. They have so much to choose from. Oh I could do so much damage with $100 in WM! 🙂 I am redoing my bedroom this summer so maybe some pillows or bed linens…or I love their outdoor furniture and accessories too. And dishes. And fancy drinks. And…Too much to choose from! I would love to buy some dishes and kitchen stuff for entertaining! Love the idea of having white plates just for entertaining. I’d def but those. Thanks! Love,Love,Love World Market. We just put on a new screened porch and I see new dishes in my furture! Also love their hard to find soda and foods. I am ashamed to say, I have never used chargers. After seeing what you did with them and how well they anchor a table, you now have me inspired! I need to shop there more! I would use the shopping spree to get chargers to make my table look a bit more finished! I’d love to try the Italian sodas & chips you mentioned, and would grab some pretty plates & decorations too. Dishes, dishes, dishes…I love them. I need to get some serving/entertaining dishes, but really I love anything that goes in the kitchen. First off, are you kidding me that I would have to narrow it down!? There are way too many things I’d love to get with it but probably would spend it on kitchen/dining stuff. I need more colorful bowls, chargers, serving stuff. So, yeah, probably that. I love to shop at world market for gifts! The interesting foods are fun and their Christmas ornaments are always so pretty! I would love new, fun dishes! I’ve never bought fun dishes. What a wonderful selection. I love it! Dishes! Most definitely dishes. The only ones I own are plain and boring and I’m ready to get a little more (washable, unbreakable) beauty into my dining. I would buy a new rug or BBQ supplies or home accents or dishes. I guess a little of everything there items are too cute. Wow I love those plastic chargers! I would spend the gift card on tableware. World Market is such a fun place to browse. I almost always find something I would love to have. I think I’d probably use the gift cad to buy a few bottles of wine. Not sure what variety, but definitely wine! I’d use it for curtains. We have none in our house yet, and we’ve been here since October! I need some new fun stuff…pick me!!! My daughter and I love World Market. We like to get glassware from there and paint it. So we have functional and pretty. We also like to look at the dishes, kitchen stuff and accessories for around the house. I honestly think if I won the gift card I would just turn it over to my daughter so she can more stuff for her new apt. She loves to decorate and does a wonderful job. That doesn’t come from me. I think it skipped a generation. By the way, the votive holders in your post make me want to go right now but alas I cannot. They are not open yet. Everything, I’d spend a giftcard on everything! I never buy stuff that I love, I buy stuff that’s functionally useful, and well, that’s no fun. I love shopping there. I have my eyeball on their Adirondack chairs right now. Love their dishes too. Thanks for the chance! I miss World Market-we used to go all the time when we lived in Las Vegas. I would so love to get some of the votive holders and dishes. They are gorgeous. Thanks. I would definitely use it to throw an awesome outdoor summer party for my friends and all our kids. Because that’s what summer is for, right?! Thanks for the chance. I LOVE World Market!! That $100 would NOT take long to spend at all for me!! I would use it on kitchen dishes and tableware!!! I would also pop over to the soda section and pick up some bottles of Birch Beer for my husband – he LOVES that soda from when he was a kid in PA and we always get some when we go into World Market which is 2 hours from here but well worth the trip every time!!!! What a great post on all things available. I have never been in a world market. thanks for the incentive to try it out. I want some new jewelry in a bad way… I need a little something extra for my post-baby look! I just moved into a new home and so I would probably buy some cute things to decorate my house with. Oh, it would be soooo hard to decide what to buy. There are just so many pretty things. I definitely think I’d get some cute new table linens and probably a pretty lantern or some votives. Or I might use it toward something big like a pretty rug. I don’t think I’ve ever actually bought any of the food there, so I might have to try out a couple of things! I’ve never been in a World Market! It looks like they have a lot of neat stuff though. We have a new home so I’d probably put the $100 towards home decor. I love fun and unique serving dishes, so I’m pretty sure I would spend the giftcard on something like that. Thanks for the generous giveaway! I would get some outside friendly dishes since we just finished our patio and every time we eat outside I cringe thinking one of my kids is going to break the dishes! I would spend it on furniture, more particularly an ottoman. Or white dishes. Been wanting those for a while. I’d invest in some new tableware. What a great giveaway to start the new week! Thanks for the giveaway! What a fun giveaway! I love World Market, they have so many great things to offer! I would get some unique dishes and of course, all the wonderful they have to offer! Thanks for the opportunity! Dishes, dishes, and dishes! My obsession! Thanks for the giveaway! There is a dining room table and chairs at World Market that I’ve been drooling over for months – $100 towards that savings pile would be awesome! I love World Market! I’d mix it up – some new dishes and servingware, and food to put on them. Hubby loves the beer and wine selection too. That big purple lantern. I really don’t think I would ever leave my patio table (it is hard enough as it is). WOW – The pictures are phenomenal. I LOVE LOVE LOVE World Market. Unfortunately, I did not discover it until I was an adult. I am happy to report – there is one less than a mile from my house! I totally <3 World Market too!!! Wanna give me a birthday present? 😛 It's coming up soon! hahahaha. If I won, I would buy a little bit of everything–food, dishes, entertaining supplies. I love the World Market and every time I go my husband has to limit what I purchase otherwise I would buy the entire store! I would buy dishes….I love to have different styles and colors! I’d go for the dishes. I have 2 cheap sets of dishes, both with only 4 matching plates. I would LOVE to have those plain white ones as well as some jazzy colors to mix and match! What would I spend at World Market? I Dont’ know–I’ve never been, though I have wanted to. I would probably spend it on a bunch of different things, but something in there would be for the kitchen. Love your posts. Love World Market. We go there to get some English food my daughter fell in love with in grad school in London. I would buy some cute dishes. I’d definately go crazy in the kitchen department. I love to wander that area especially! What a beautiful party setting! I’m sure I could find something fun in the BBQ section to bring home. Your table turned out so fabulous! I would probably buy a little bit of everything. Thanks for your wonderful blog. Going to World Market is a huge treat of me. I love love love their buffet dishes and wide variety of decorative serving dishes. I helped my daughter decorate her new apartment with a couple dishes to hang on the wall. Pick me and I promise to spend the money wisely (haha). Oh, and the chocolate is yummy too. Not sure…probably some really good looking food/spices to cook with. I have an ongoing love affair with World Market too! It is seriously one of my favorite stores for home decor (and jewelry too!). I would be beyond thrilled to win the gift card. We’re moving and I’m redecorating the entire house so I could use the gift card a million different ways. Thanks, Sara! Food! They always have the coolest selection of yummy goodies & we love trying out new stuff. Plus their wine selection is to die for. Wish I could set up a table like you, that looked so pretty! I would spend the gift card on dishes and Italian soda. Love that stuff! Hmm, I think I’d spend it on snacks and dishes! We don’t really need any more snacks (but I just can’t resist), but our dishes are old unattractive hand-me-downs … we could use an upgrade! Oh how can I choose? Probably entertaining goodies. I LOVE World Market! I could really use new dishes for our beach house! Love the choices!! I would buy some serving dishes. I love to host for book club and brunch! I think I would use a gift card on cute tableware. Wow-great giveaway! I can’t decide, I need some new towels, something in home decor maybe. We are moving soon and sprucing up our new place would be wonderful. Thank you for the chance! I have never been to World Market, I am going to the website though when I am done here. I would probably try a little of everything and then some. Thanks for the giveaway. I’d love to own some white dishes for better food photography. I’m learning so much about pictures on your blog, plus to die for recipes. Your table is ravishing. Blessings. I definitely need barbecue supplies. Loved this post!! I would LOVE the prize, so I can try to replicate your precious table setting and host my own little party!! World Market ROCKS! I would love to get some new dishes for the kitchen. I’m trying to get away from floral design glass plates! Anything, Everything! But what I really need is some new dinnerware! I would love to win, world market is also my favorite store! I would use a gift card on pretty and unique home decor. Oh my….there are only about a MILLION things at World Market I’d love…but I’d use the gift card towards new patio furniture for our new outdoor patio area (the small bistro table isn’t cutting it!). Thanks for the chance to win! I could totally use some new dishes, and I would love to get some yummy food from them also! I would definitely spend it on dishes. Nothing in my house matches, and it makes me crazy! The world market by my house recently closed. But there is another one 20 min away. What would I buy? Oh my, the possibilities… I always liked their seasonal stuff. It is so unique! What a great give away. I love World Market as well, but eyes are always bigger than my wallet : ) I would love to buy some cute serving dishes! I’d probably buy a little bit of everything. I don’t get there often but it is a seriously fun store! I can always find something I want there. I would probably spend it on jewelry – there are lots of great earrings. I would totally spend it on those amazing looking dips and then lots of cute plates! I can never justify buying a new set of plates, so I would splurge. 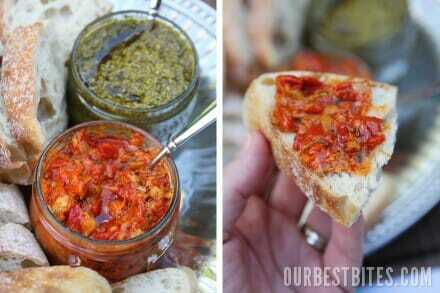 And I have a weakness for pesto and brushetta, so lots of that too! I’d love to buy a nice chair to sit at my sewing machine. I love World Market’s furniture and I don’t love my folding chair. When I discovered World Market in junior high, I thought I’d stumbled on to a treasure trove. 🙂 I still love it. Would LOVE a gift card to splurge on something for our new condo decorations. OH we LOVE World Market especially the food. I lived in Germany as a child and have shared my love of foods with them. I am afraid I would end up spending the majority of the gift card of sweet little delicacies to stock our pantry. And thank you for reminding me!! Our youngest turns 12 this week so I think I see a trip to World Market is in store. It is almost an hour drive away but he LOVES it as much as my husband and I do!! how fun!! i am also mildly obsessed with world market! i think i would buy a little bit of everything….there is just too much to choose from! I love love love their kitchen supplies!! I would easily spend that gc in there… and then move onto the food, baskets, linens etc. I would spend the gift card on curtains for our baby boy’s bedroom! He will be here in October! I would go crazy with dishes and vases. I would use a gift card on dishes and linens that I could use on my blog, too. My kids would have to pick up a few of the toys and some snacks, too. I am getting ready to move into our first house and have been eyeing several things at World Market. I would love to get new dishes! Love World Market! Oh I love World Market. I’ve only been once and I did not buy anything for I feared I wouldn’t be able to stop once I started. How I would love to win a gift card so I could buy some new table settings and fun accessories. Thanks for posting the best recipes ever! I make one every night! Ooooo… I would spend it on food from around the world. How fun! I LOVE World Market! Definitely one of my favorite places to shop. I would love to have pretty napkins,plates and placemats for my blog photography! Thank you for a chance to win a great giveaway! Oh I LOVE World Market! Such a fun place to explore! They have the coolest stuff. I would spend the gift card on a variety of things- probably mostly dishes and kitchen stuff! Your table decor is so inspiring! I love the World Market! Growing up we always got the best stocking stuffer from World Market. Now I go in a swoon at many items wishing I had money to spend. June 20th, is my wedding anniversary. Just saying it would make a great gift! I’d buy fun containers for homemade spa products, stuff to wrap them with, and some great cloth napkins in hopes of breaking the paper napkin habit. Thanks for sharing — your ideas are always awesome! I would use the gift card to help furnish our new home, and to try some neat foods. ooh! World Market is my fave! I’d spend it on furniture, maybe for the patio? I would use the gift card to purchase some of the wonderful entertaining pieces that they have avalable. I’d definitely spend it on some new plates/silverware for entertaining… we have 6 in our family and only 7 dinner plates (our originals from our wedding 10 years ago minus the one I broke ;o) Whenever we have company we have to use paper since we don’t have enough for everyone! This would be awesome! Thanks! I would probably go ahead and use it on a little bit of EVERYTHING! Colorful serving dishes…and food…and jewelry…and whatever else I find! In fact, I’m going to go check out World Market this morning as soon as they open! I haven’t been since I moved from Oregon! What a fun morning! Good idea! I’ve been wanting the Aiden End Table for awhile now. This would definitely make a dent in the cost! This is the first time I am commenting on a post, but I have been a quiet, loyal fan for a while now. 🙂 Love your recipes, and am a little obsessive with my new-found love of cooking. I also love World Market. If I won the giftcard, I would definitely spend at least a small portion of it on some cool kitchen gadgets, even though I really can’t fit much more in our tiny student apartment drawers (because let’s face it, I have a problem… and the drawers aren’t big to begin with). I would also love to get some cute dishes and cute home decor. I love, love, love cute stuff like everything pictured in this post, but haven’t bought any yet since my husband and I are just about to embark on a 4-5 year Pharmacy school adventure, and sometimes cute dishes/decor money is better served as tuition payment… haha (though, sometimes I have to practice some serious restraint (: )! And any remaining money, I would buy some cool foods to try from other countries, because I love food, especially if its something new. I could go crazy in World Market!! I would definitely hit up their kitchen section for some new plates! Most likely some cute new dishes! Furniture! I’m newlywed and in need of home decor! Dishes! I have a glass gene/obsession. And maybe table linens. Oh too many choices!! i want lots of things! Yes please! Yes please! What wouldn’t I buy? I could spend hours in that store. Love! Such a pretty party and gorgeous flowers! I love World Market. I’d probably spend the gift card on some gourmet foods and cute decorative party supplies. Love World Market pillows! I need some new ones for my couch! I would probably buy something for my kitchen! I would buy some new plates. These look so pretty. I could totally use some cute dinnerware!! With 3 small kiddos, what pieces I have left definitely leave something to be desired. It would be so fun to have an actual set! I would use it on some cute summer things for my deck! Colorful plates and candles! I would buy a little of everything, but would pay close attention to their cute dishes and napkins!! I would buy stuff for my kitchen when I move next month! I would buy a little of everything! I’m getting married in 6 months, and I’m sure I’ll find something I “need”. Love your blog! I confess I’ve never been inside a World Market! 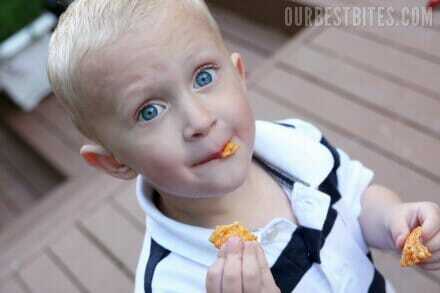 So I might just go crazy after seeing your pics on “a little of everything”! I’ve been going there a ton looking at dining room tables. With a new addition to our family recently we need a new table desperately and I love their style! There are many things I’d like to use a gift card on, and the white wide rim dinnerware sets are one thing I’d like to buy. Hey Ladies, I think I need inspiration in all areas. I am hosting an family reunion this summer and the gift card could be really handy. Thanks! I love your blog! Wow! I can hardly decide what I would buy…Our dishes are all mismatched, so probably some of those plain white beauties! Thanks for the giveaway! ooooo the possibilities!!! I would love to try some of the food in your blog! Yummyful! Maybe new dishes to put in my refinished cabinets. Food too! We recently (last fall) had a deck added to our house. This spring, when it warmed up, we purchased some extremely some furniture that fits in our space, but isn’t necessarily beautiful. Going more for furniture that would stand up best to the weather (as well as cost effective) and I could make it beautiful with other accessories, that I could take inside to store. Our outdoor space is in need of cushions, dishes, lanterns, and railing planters – or perhaps food for our best dinner party of the season..
You’re post got me all excited about my birthday. In two weeks we’re planning a similar shindig to celebrate, and I would spend a gift card to World Market on fun decor for the BBQ! I would probably buy some basic every day dinnerware. Theirs has gotten very good reviews. Furniture!! I love the furniture there but I’m to cheap/practical to spend much money there. But I WANT to!! I would love to win a gift card to World Market, if I did win I’d probably buy some cute serving dishes. I love to entertain! I love World Market! I would probably spend it on decor… there is a ton of Asian decorations, which my husband and I would love to get! I would use it on decorations for our guest room and baby room! I LOVE World Market! Their Tiger Tiger Tikka Masala sauce is the best. We’d use it on BBQ supplies. We grill out almost everday during the summer, and I need some good supplies! would get some fun new table decorations for our new house and deck! I LOVE World Market – hope I win!! Would buy a little of everything, for me of course!! I’d wander the store for hours, wanting to buy everything. Then I’d either settle on art or dishes. Or patio furniture cushions. Or coffee. Or scarves. I love World Market. I would use it for food and some accessories for my girlies. I LOVE fun condiments and yummy chocolates! Oh, I love World Market too!! I could easily spend $100 on their super cute photo frames. They are the best!! I love looking at all their lovely styles of furniture. A nice chair would be perfect. I adore World Market and would have no problem spending the gift certificate. The table setting and flowers are gorgeous! I’d definitely spend it on dishes. We need to update our ten year old dishes! Probably a little of everything! I need more servingware, dishes, and cute things for my house. I don’t even know where I would start. I love dishes and linens and lanterns and glass and probably everything. Your table design was soooooo wonderful and fun and summery (is that a word?) How fun it would be to have $100 to spend at such a cool store. The bamboo runner really made everything fit together. I would probably buy everything that you used on your table and I will definitely try the soda and recipes that you show. Thank you so much for your blog and great ideas. Yes, I’ve always loved that store too. It’s hard to narrow down what I’d buy but probably some home decor and some gourmet food! I have never been to World Market, it sounds amazing. I have been wanting cute serving dishes, so that is prolly what I would spend it on. Keeping my fingers crossed:) Thanks! ALL summer. raspberry lemonade here i come! I would use the giftcard to purchase fun decor for my house. Maybe some summer-y dishes, or table linens. The options are endless at World Market! Love that place! Oh I love World Market! Ours is far enough away that I am not tempted to go there every day, but this gift card would be an awesome excuse to make the trek! I would use it to “pretty up” my backyard deck. It so needs color…pretty pots…outdoor tableware…Thanks for the opportunity! I LOVE World Market and make a trip almost weekly! We have quite a bit of furniture from there and I LOVE their cute entertaining pieces! I would use it on a little of everything! World Market has everything! I am in need of some outdoor objects for my back deck so that would be a start. And then i would spend some on the food. and then wall decorations. and then some jewelry. Oh, i don’t know. I guess honestly, i would spend this gift card on a little of everything. I love Target – and spend way too much money on things I don’t need there. I’d probably do the same at World Market. If I won the gift card, I’d spend it on something really pretty that I absolutely don’t need! Tableware, for sure. Outdoor accessories, too! I’d buy pretty plates! I’m looking to expand my collection so that I can introduce some variety on my blog :). Everything, but mostly decorations for my house! I would buy dishes. I alwasy ogle their dishes everytime I go in. They have such a great variety in terms of color, shape, and style. Love it! I love World Market too! If I win, I’ll purchase some tableware for outdoor entertaining. I LOVE thier furniture, and since we are in need of some outdoor stuff…I believe I would go for putting the money towards one of their cute outdoor dining sets. Maybe the old fashioned bistro style ones??? If i won the gift card, i would use toward the dining table my wife and i have had our eye on. We just bought a new house, and need a bigger table fir family get-togethers. World Market rocks!! I would spend a gift card on kitchen/cooking accessories. . .and those darling polka dot coffee mugs!!! Dishes and table settings for sure! That table was so lovely! Oh, the possibilities. Probably some interesting decor for my newly finished basement. Crossing my fingers. If I won, I would use it on kitchen items for sure–such cute stuff! I will get those aqua chargers. Gift card or not. Just saying! I too LOVE World Market. They have amazing food and treats, love the furnite too!! First of all, love the blog! I just found it and have already made a ton of your recipes–so, thank you! As far as World Market, I would buy fun home decor and cute storage options, I think. I would definitely have to get some of the different European chocolates and candies. I’d also probably need to get some cute dishes and housewares. I’d definitely spend the money on accessories for my boring apartment! I would spend it on furniture, even though it wouldn’t go very far! I have a major obsession with World Market too! Just can’t get enough of that place! Awesome! I think I would invest in some summer dishes. I’d buy the dishes. Especially the outdoor ones. I’ve got an obsession! If I won the gift card, I would get some new dishes. Love the color of those chargers you have. 🙂 Beautiful! oh my goodness please please please me!! i am in desperate need of cuteness for sprucing up my place!! i havent bought any decor since me and my husband moved in together about 5 years ago and that consisted of a a table cloth and some picture frames eeeek. cause all our money was spent on actual furniture. Oh and i love you ladies and all your recipes ive made so far have been total hits!! Love you ladies!! I think I would just use it on a little bit of everything. 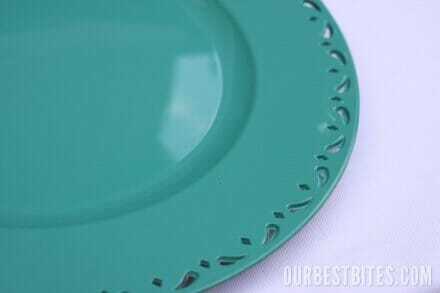 I love the plates though that you used with the cut-out edge. So cute. I could really use some new dishes! Just bought curtains there last week. I definitely need more things. Like a beautiful piece of art I saw when I was there. And whatyaknow? It’s $100. I just got new dining room furniture so I’d spend the money to create a tablescape with lanterns and smaller votive holders similar to the one you featured on the table. Perfect for summer! I would have to say kitchen stuff. I love having a well stocked, cute kitchen. What can I say? I’m a stay-at-home-mom, I practically live in the kitchen. I love you guys! So does my husband since I started branching out my cooking skills under your tutelage! THANKS! I’d spend it on home decor, for sure! Probably a new lamp, and maybe a fun door hanging to spruce up our front porch. And a gift for my mother-in-law, who loves World Market too! We’re almost finished building a deck in the backyard. I’d love to be able to get some fun things to add some color out there once we’re done! I LOVE World Market and am sad because I don’t have any stores near me. I found out about them on a trip down south. I have to choose what I would buy??? Probably home decor or kitchen and dining…although I loved those cute sodas in this post too! can i tell you that i have never even been to a world market store? i know, hard to believe, right? my friends have, but i have never lived close to one. i think it is time! I just went to World Market for the first time last week! I was visiting my family in Las Vegas and my sister-in-law took me. They always find the cutest things there. I got some good salami and some ramekins. If I won I would get more and some cute dishes. I have never been so I can’t say for sure what I would buy. But I k now I would have a great time looking! This would be the perfect reason for me to check them out. I have never been to World Market. But I love what you did with that party. My husband and I finally are living in a house and we want to entertain outside this summer, but we don’t have much. So I’d probably use it on that, entertainment things for the backyard. Plus, I need some table cloths as our table got very damaged in the move. I’d also get plates, oh those are so pretty. I’d just go crazy, is what I really mean to say. I love World Market! I was just there this weekend and loved everything! Especially these purple and gray floor pillows for my new nursery! I would definitely decorate with it. I love it! The table looks amazing! Can I copy you and say I would get those adorable plastic plates? I love plates like those. They look expensive but aren’t. Oh please pick me! Ahhhhhhhhhhhhhhhh!!!! I have SO many things I would want to buy! Definately serveware…..some candles….some house decorations….some jewelry….some wall decor….some food (especially candy)….it is such a cool store there are just so many things to choose from. Too bad we cant just package up the store and ship it to my house, that my friend would be AWESOME!!!! I would love to get some fun dishes for when we entertain people. I absolutely love the chargers you used. I could definitely use some of that great outdoor furniture! I love World Market! I need some fun food for a carnival themed birthday for my son. I LOVE this store… a gift card would be the perfect excuse to treat myself to some new chargers and the votive candle holders to create my own outdoor party! Love all the ideas in this post! I think I would spend it on decorating. I love their placemats and little details to make a room just perfect. Ohh–I love World Market!! Definitely would be getting some fun patio items. It would be so fun to get some new dishes. The plain, white Correll is pretty boring. I would buy dishes and fun kitchen gadgets! Thanks for the giveaway. I would definitely use the card for the food! I love World Market! While there are so many great options, I just can’t seem to stay away from all the kitchen-related items there! I would spend it on kitchen stuff. I love World Market!! I would definitely spend the $100 on dishes and fun entertaining accessories! I would totally buy the candle holders, dips, plates, my list goes on and on! they have the most awesome dishes and glasses. i’d definitely spend it on cool glassware. 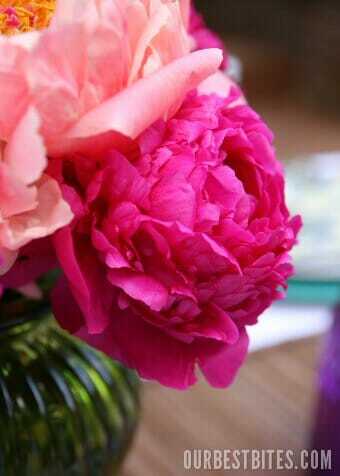 something to brighten up the table. thanks for the giveaway! I LOVE World Market! The last time I was there I saw a gorgeous TV stand/hutch that I would love to get. They also have adorable patio furniture that would brighten up our boring porch! I can’t believe I have never been to World Market – they have such cute stuff! I would spend the money on new plates – mine are looking pretty sad these days. ooh count me in. I am sad to say I have a Wold Market about 5 miles from my house and have never been there! I need to go! There are so many things I can think of that I could buy at World Market with the gift certificate, kitchen stuff, food, outdoor items…! Dishes, definitely! I’m suddenly a freak for cool dishes. What is UP with THAT?! I would definitely spend it on dishes. I love dishes but am running out of room!! I’d love to spend the gift card on fun foods for our upcoming 4th of July party! This is such a great give-a-way! Thanks so much! no question….I’d definitely spend it on food because every time i go there i just can’t make up my mind which little treats to get as they are all so exciting and yummy looking!!! I love World Market!! Its one of those stores you can go into and just spend hours in. I would probably just get a little bit of everything, but I thinking most of it would go into stuff I could use in the kitchen! I know there are a million things I am interested in at WM. I will try to focus my shopping energy on outdoor entertaining items, but I definitely will not limit myself! 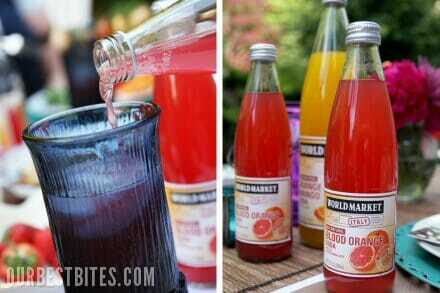 I will also try one (or two) of those Italian sodas!! Thank you for the give-away!! Sounds delicious! They have the best chocolates there! Without a doubt I would get stuff for entertaining. Our patio has just been redone and now it’s time to invite and party all summer! I would probably spend it on something for my walls. We moved recently and now I have huge empty walls and nothing to put on them! I would use it to buy tableware, and replace my old beat up ones. I have always found such wonderful things on line and am so sad we don’t have a store in our area. I found a really cute apron I’m getting for myself even without a giftcard. Thanks for the coupon info. Oh.my. Decisions, decisions. I’d probably go w/some of their cute tableware. I just received your cookbook as a gift. I would LOVE the gift card so I can buy pretty things to eat off when I use your delicous recipes!! What wouldn’t I use that World Market Gift Certificate on? I would buy the white plates and a plate holder, and if they aren’t over $100 I would love to try the pesto and artichoke spreads. My mouth is watering thinking about it already. But, win or not win, thanks for sharing your website! It is a bright spot in my work day when my head is aching and I want to go home, I escape to Our Best Bites for a quick visit to the feeling of home! Thank you! I served my mission in Germany so World Market is a favorite spot to get that hard to find German food goodies. YUM! It’s been a long time since I’ve been to World Market. You’ve definitely got me wanting to go. I’d probably spend my card in the kitchen area, but don’t know. oh my, you girls amaze me everyday! I can’t believe your creativity. That table was gorgeous! It makes me want to host a party tonight! Love your blog. Thanks for sharing. Dishes and food. Thanks! Love your blog 🙂 I have made so much delicious food since discovering it. I love World Market! I would use the gift card for some dishes and some of there yummy treats! I am in desperate need of new dishes! I would LOVE to get them at World Market! I would definitely love to get some cute tableware for entertaining! I would use it to buy dishes for sure! 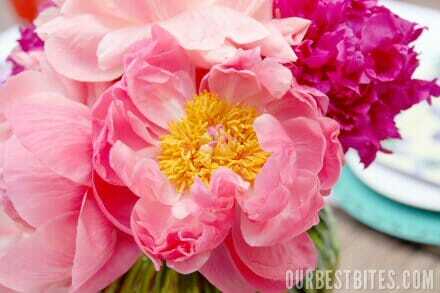 I just love all the beautiful and bright colors. And I might have to pick up a few of those lanterns as well! I LOVE World Market but there isn’t one anywhere near me. My husband and I make a special trip to one near his parents twice a year. If I won I would buy all the gourmet cooking ingredients I could find! I am hosting my parents 50th anniversary party so of course I could use several things from World Market. I think I’d have to go for a little bit of everything! It looks awesome! I’m in need of some fun summer dishes. I love them all. I would spend it on a little of everything! I love free deals! This would be awesome! I would use this to purchase something (or things) snazzy to spruce up my apartment. I have lived there for almost 4 years now and haven’t done a thing with the place because you know we are renting, I hate the tacky 80’s wallpaper, etc. But it looks like we will be in said apartment for another 3-5 years so I think it’s about time I put my mark on the place. After this post, I think I would be looking at spending it on some food! I am not sure if the last one took so here we go again. I love your blog and I love,love World Market!!! I feel out of the loop. My first time entering World Market was just 4 months ago. I wandered the aisles for about 3 hours dreaming of what I could create. With the weather finally warm and inviting I would LOVE to create an outdoor living space. We love to hang outside at nights as a family. Awesome! I would use it on dishes and dining accessories (place-mats, napkins, etc.). I’m so glad you introduced me to World Market! I’ve heard of it but never been. I would totally buy dishes. We never found ones we liked for our wedding, so three years later we still have a mismatched bunch of sets. New ones would be awesome! LOVE the table setting. I would probably buy the exact same stuff to create that gorgeous table and maybe throw in some foreign chocolate! Love that store! We are building a new home so I will definitely need this card! I would probably use it on some decorations/furniture! I forgot to say what I would use it on. I am hosting my parents 50th anniversary party so I would absolutely use it for that. I’m thinking I could use a little bit of outdoor flavor. Our house is tiny, but our patio is divine. Outdoor eating is our favorite summertime family activity – so why not make it more festive?! I’m hosting a surprise 60th birthday party for my mom. This would help out a great deal! I LOVE World Market! I’ve been going there since it went by Cost Plus (World Market is a much better name). I would probably spend most of it on food. My husband and I love the food there. And my Ghiradelli chocolate chips are a lot cheaper there than at the grocery store. I think I would buy a bit of everything! Definitley something that is cute but I don’t really need! I would use it for desperately needed new dinnerware and kitchen utensils. Probably a little bit of everything! I have not heard of this place, so I will have to check it out! A World Market just came to SLC! I went last week and spent too much, but I wanted to spend so much more. I would use the gift card on more dishes and table linens. Can one have too many?? I think not! I love their dishes….I would stock up! I would use the gift card on dishes and probably some yummy food! I love World Market too!! I would buy some cute serving dishes for entertaining! As I may not win this little contest – I’m not the luckiest girly around…when it comes to contests I just want to let you gals know that I love your talent and this blog. I can’t wait to get your cookbook….oh I would have by now If it weren’t ALWAYS sold out 🙂 everything I’ve made from your blog has been divine! Thanks for sharing your talent – it’s inspiring. Dishes for sure… I could use some new ones! I started loving World Market as a kid too! They always have the most unexpected finds! I really liked all their BBQ stuff…also liked the nostalgic candy!! Well, $100 of Italian Soda sounds good to me. Blood Orange is my favorite flavor as well, over ice with a little heavy cream. Or a new rug, or accessories, or dishes, or kitchenware. I love World Market! I would buy those votive holders, so cute! What a beautiful outdoor meal! It looks right out of a magazine. I would probably get a little of everything. Some dishes, decorations, and maybe some food? Who knows. I love that store! I would spend it all on dishes! Oh, man! I could spend so much in World Market. Right now I have my eye on some new curtains and throw pillows for my family room. Then again, I LOVE their outdoor stuff and could definitely use some new cushions for my patio furniture. I love World Market! I would probably use it on something for my kitchen. I love this place! I would spend it on a little of everything. Sounds funny… but I love their hand soap. lol! I would love some new dishes and World Market has such a great selection, that’s probably what I’d buy. We just moved to our first house and things are a little sparse, so I would use it on furniture or a little decorative flare! We just moved into a new house, and I have my eye on many things at World Market! I would use the gift card to buy a rug for my living room! The dishes we have are from World Market so I would probably buy more of those. I love the bowls particularly! And then get some of the fun food they have! Thanks for the chance to win! I would buy several sets of the Boho Summer Striped Dinner Plates for our family gatherings. Thanks Love the blog! We just found the kitchen table of our dreams there. Took us months to find. And such great prices on baking stuff. Enter me, please! My favorite things there are the random little things that I find I MUST have! normally I’d spend it on home decor or dishes, but those food items look so yummy I’d love to try them all out! I have a slight obsession with cute dishes, napkins, placemats, etc. That’s what I would buy to my little heart’s content! Some new dishes and maybe a few of those beautiful candle holders! I love world market! I would buy some cute dishes. Love what you did by the way. The colors you used to decorate the table are so pretty and it looks like you had a great time! I’ve never been to a world market before but it sounds amazing!! I could really use some new dishes or maybe BBQ stuff for dad?? Thank you!!! I would get some home decor or some jewlery. I don’t know how I’d pick what to buy – I love World Market!! Woo Hoo! I love World Market! I would use the card toward the Mason computer desk. Being a (newly graduated) graduate school student and married to a phd student, it would be wonderful to have a nice desk to do our work at. I would get a little of everything :). Such a fun place to shop! I think I would spend it on a little of everything but mostly the dinnerware! If I won I would use it to buy some new dishes! Wow! That table is pretty! I love World Market too! During Christmas they have the neatest ornaments. I like going there to find inexpensive but nice gifts for people. Anyways, I would probably end up purchasing some nice tablecloths and maybe some drinking glasses. Ok, there is so much at World Market I love that I know I would have no trouble spending it, I would go with a plethora of cute home accessories for sure! I would spend it on some home decor, more specifically for our bedroom. It needs some personality! And/or window treatments for the living room! …or tableware for entertaining…hahah I just don’t know. I have always had a deep, deep love for World Market!!! I can spend hours in there. :+) With the gift card I would buy a little bit of everything…why not!!!! We need a new kitchen table and I LOVE their furniture! This $100 gift card would really help make it fit into my budget! Thanks for the chance to win! I would spend it on a little of everything! I want my picnic table to look just like your example! It is beautiful. Thanks! I love World Market. I have a whole Pinterest board filled with their stuff, but I would definitely start with napkin rings–I’ve been looking for good napkin rings since we were married four years ago! If i won the gift card i would buy some things to spruce up my back patio! Maybe some cute flower pots or a nice vase. I love world market. Some fun new dishes or a shower curtain would be awesome. And, of course some yummy British candy. Oh gosh, I’d probably be absolutely overwhelmed and spend it on a bit of everything. Actually, I’d probably focus on stuff I could bring to college with me – it seems like the sort of place I could find all sorts of cool dorm equipment! I love World Market too! And I’m going to see you later today at the book signing in Houston! Love your blog! I love World Market furniture! However I would probably soend it on kitchen stuff, I love their dishes too. Actually I am like a kid in a candystore in that place. I am pretty certain if you gave in $100 I would spend well over $100 haha! Oh well evertime I go in there is like there is a $100 cover charge! I would use it on decor for my house! I recently got married and we just moved into our new house and it is BARE! I LOVE World Market! The outdoor tablescape you set up is HEAVENLY. I’m a sucker for turquoise too…and those chargers and dessert plates make my heart melt. 🙂 There are so many fun things at that store, I’d have a hard time deciding! I’m always a sucker for anything that for the kitchen, though. I love World Market too! I need some new dishes so I can set a beautiful table like you do. And I’m going to see you later today at the book signing in Houston! Love your blog! We’re in the process of redoing our bedroom so I would grab some cute pillows or art. I think I would use a gift card to buy cute dishes!! Cute decor or kitchen items for my new house! I would so get dishes. 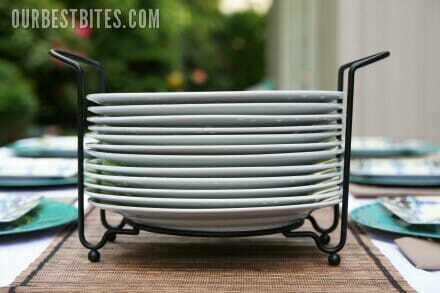 I need (okay it’s really want) a whole set of dishes for entertaining, especially for BBQ’s. The italian sodas wouldn’t be too far behind on the list either! I would buy all sorts of entertaining things. Plates, serveware, tablecloths. How fabulous! I love World Market! If I win, I will use it on serving dishes and colorful throw pillows! I’ve always wanted to shop in the food section & buy the different marinades, oils, snacks, treats, etc… but I always end up buying home furniture or decor items & can’t afford more! If I won the giveaway I would most definately buy a table cloth that I have been coveting since march & then I’d use the remainder to dabble in the food section. Love it! I want it! I love your table, it’s so pretty! I would love to throw and outside dinner party with it. I would LOVE to win this. I have plans to go to World Market this week to stock up on some food items. I think I would use the gift certificate to get some pretty new decorative knobs for our cupboards, chocolate (in a bunch of different flavors! ), and Sweet Tea Wine. Oh I hope that’s back in stock for the summer. I’ve been impatiently waiting. World Market is an awesome store with all kinds of goodies, so I don’t know what I’d spend it on, but I’d find something great! I LOVE dishes, and cookbooks. Cooking not so much. I would definitely buy outdoor dining items. I love World Market too! I think I’d use a gift card for kitchen supplies- they have great stuff! oh my gosh, i love that store. i never go in there with any particular plans, and i always leave with a cart-full. they have fantastic tea and wine options, not to mention really fun candy. great giveaway! I LOVE World Market also! I would use the gift card to buy some fun summer entertaining dishes and outdoor decor (love those lanterns!). I’d spend it on a little of everything that I would normally never buy! I absolutely love World Market too! I can spend hours just walking through the store. I would probably buy tableware or decorative items I can to use for outdoor entertaining with a giftcard. I would use a gift card on specialty food items I can’t find in the city where I live and fun dishes. I love World Market but I have only been there once. I spent a couple hours in there, just looking at everything! I’d spent the money on a little bit of everything–the fabulous ethnic snacks, home decor, and jewelry! I would spend it all on food and candy! Yummy! I love that store!! I discovered it a few years ago and I think it’s the greatest place! I LOVE world market!!! I love their italian sodas, dishes, decorating items, I love it all! I would completely use it on a little of everything. Their stuff is wonderful, but we are tight on cash so I rarely buy anything there. Just wander the isles and dream. If I won the gift card, I would use the money to fill my new house 🙂 or I would fill my cart with those lanterns & votive holders….they are my collection obsession!! I would love to win this Gift Card! I am a teacher and I have been looking for Cultural items to hang in my classroom. World Market has a ton of things that I could use! (I might even have to use a little of it for home decor too!) What a great opportunity! I love World Market and can never walk out of the store empty handed. I would spend the money on a little bit of everything. Food, Candles, Dishes, Decor, you name it! Love love love world market!!! I would definitely use a gift card to help decorate our baby’s nursery, it needs to be done by November!! Dishes, definitely. I need some cute ones. Probably a little bit of everything. I usually can’t leave without something for baking, though. I have dreams of such beautiful entertaining. I would definitiely invest in some of their fun dishes and candle votives. Oh how I love World Market!! I can always find something there that I don’t know how I lived withou! It is my go-to place for thoughtful, one of a kind gifts for those hard to shop for people. I love parusing the food selection and all the kitchen supplies/gadgets. You could say I’m a kitchen gadget junkie, so I know that’s what I would spend my money on! What a great post! I haven’t been to World Market in a long time. I think if I won, I would use it towards some new dishes. Thanks for the inspiration! I love world market too!! I just moved and would love to add some fun pizzaz to my place!! Your party looks so fun! Just beautiful. I fell in love with World Market when I lived in Houston; since I moved away I am so happy they have a great online store. I think I would use the giftcard for a variety of things but mostly cute dinnerware. I would use it for serving dishes! I think I’d spend it on a little of everything-which would definitely include those purple lanterns. I absolutely love World Market! As a college student, you really have to get creative & resourceful when entertaining on a budget. I would LOVE to get some more cute dishes, and those votive holders are calling my name!! They would really take my entertaining up a notch! I’d spend it all on their shawls and scarves. I LOVE World Market! If I had $100 there I would probably get a few kitchen gadgets (love their spice racks). My dream is to someday get a dining table from World Market, which will take a little more than $100. I could spend countless hours and exorbitant amounts of money at World Market! Love that place 🙂 I’d spend the money on items to decorate my kitchen. Would love to get some kitchen and dining stuff and some home decor. So much to choose from, thanks for the chance to win. A little bit of everything!! I can spend hours in World Market just browsing. I just love that eclectic style! Wow! How exciting. I think I’d probably just use it on a little bit of everything! Although, I’m kind of loving those green plates! I was looking through my dishes just this weekend when we had company, realizing that I have been married for some time now and I have not updated my dishes much since my wedding. Scary. I am definitely over due for a make-over in that department, but would not turn down the opportunity to save a little somethin-somethin for an amazing assortment of unique food. I love World Market!! I need new dishes desperately! I love World Market and acually made a note on my ‘to do’ list while reading this post to stop by there to look for a delicious red pepper dip/spread that I heard they sell! They have so many things I would love to buy there…baskets, dishes…and I really enjoy looking at their furniture too! I would definitely use the gift card for all the fun food they have and some cute new dishes! DISHES! DISHES! DISHES! I love to entertain, but if I want to do something a little nicer than paper plates I have to resort to using 4 Christmas plates, 3 hand-me-down lovies from my grandma, and then fill in with my everyday boring plates. It’s NOT a good look! I would definitely be getting dishes. Let the entertaining begin! Your table looks beautiful! I think that I need one of those beautiful headbands. If I won I would just go crazy getting all sorts of awesome things! I would definitely use the gift card on food, probably stuff I don’t normally buy (fancy drinks, pesto, etc. ), for an outdoor summer party. 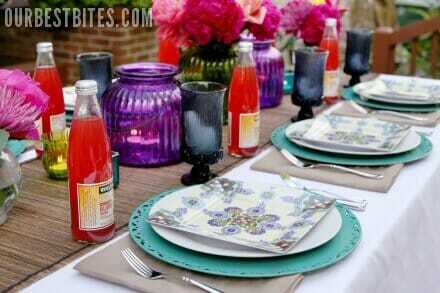 or maybe some party ware (i love those colorful votive holders and jars with candles in the post!) we just moved into our house last year and haven’t had a backyard party yet (blasphemy!). I’d really like to do it up right. If I won the gift card I would first find a babysitter, and second wander up and down every aisle of our local World Market and who know what would end up in my cart! For sure it would all be amazing though! I would probably get a little bit of everything! I have never been to World Market before, and it sounds amazing!!! I’m a sucker for candle holders, so I might just spend it all on those! Thanks for the chance to win. I’ve just discovered your site and made two of your recipes for dinner last night. They were great! We’re building a house and I’ve been eying the Verona Trestle Table. Beautiful table to eat beautiful food on thanks to y’all! And I’m jealous you got to go to Trophy Cupcakes. I used to live 2 blocks away from the one at University Village. Oh. My. Yummy. it looks like a vacation picture! i would love to win to set something up for when i have bunco 2 my house. I need some bowls. I don’t know where mine have gone but I’m down to five. I would buy some new dishes for company and special occasions. I only have the same plain dishes I bought when I was married six years ago. It’s time to update! I would get the Chains Outdoor Rug for sure! I’m finally getting furniture to put out on our deck and that would just make it look fabulous!! oooo…I want a little of everything but especially some of that beautiful dish sets and also I love the lemonade containers, and how much fun it would be to put together a BBQ after these items. I would use it for furniture since I just bought my first house! There are soo many things!!! Hard to choose! I think I would first start with the Good Grips POP Storage Containers, since I need to organize my pantry. I also loved the White Provencal Dinnerware 🙂 What can I say, love kitchen stuff. You girls always have the best ideas!! I look at your blog every morning and it helps me decide what to make for the week, so thanks! I love World Market as well, and there is one right up the street from my house! If I won the gift card I would spend it on dishes, candles, and barbecue supplies!! Wow, how much do I wish you hadn’t introduced me to this site!? I want everything! I think I’d use the gift card to get new dinnerware, or curtains, or a goddess beach towel, or a nightstand. I could go on and on. Ooohhh…I’m in love with World Market!! I’d buy a little of everything with the gift card. Then, when I win the lotto, I’d buy everything else!! We love to entertain outdoors and have just purchased some paper lanterns from World Market (the battery operated ones). 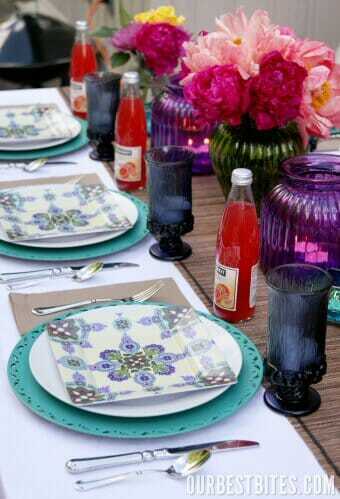 I’d love to add a more colorful punch with a fabulous table cloth and throw pillows to cozy up our space! Thanks!! Um, heck yes I want this! I always have walked past that World Market never knowing of it’s hidden treasures! Who knew? Anyway, just pick me, m’kay? I would put it toward a new patio set to complement our newly re-done backyard! Oh I loooove World Market! I would look at jewelry and some funky wines! I’d probably put it toward a fire pit! I love World Market! I typically buy jewelry, candy, and furniture there, but you have inspired me to buy food and dishes! I love the way your table turned out! I love your cookbook too. You guys are great! Ooh, FUN idea. I’d wander through the store looking for ideas of what to make for dinner for my boyfriend’s Mom, who doesn’t eat garlic, onions, leeks, cilantro, cumin, or coriander. And I’d spend my shopping spree on whatever ingredients I need to make a meal without those things that still has lots of flavor! I’ve never been to a world market … but would LOVE to go! I would probably get some cute accessories for my covered deck! Love it! I would spend it on the food & get some new dishes. We are a military family and our dishes are always getting broke in moves. I have never owned a really nice set because they always get broken. I would buy whatever caught my attention, so probably a little of everything! P.S. What are sisters for if not to do most of the cooking when you are in town? Did she approve of the hook-up line you threw in there? Tableware, dishes and tim cascade chips! 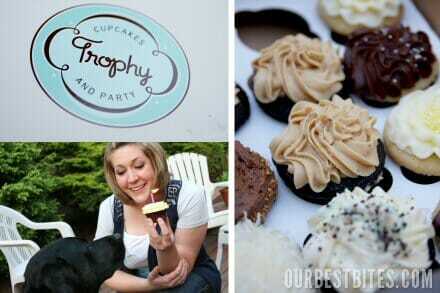 I LOVE Trophy cupcakes and it’s the thing I miss most about Seattle (after friends, of course;))!! Even in Chicago, there’s no other place that compares to Trophy. I want some fresh new pillows to summerize my home right now! I think I would end up getting a bunch of random things- they have so many fun, unique items! But I would definitely have to get a scarf, and some food items. I would looe new dishes! What a beautiful post and fantastic giveaway! I’d love to go get some of those gorgeous dishes – and yes, some of that artichoke spread, too. Yum!! I mean, I would LOVE new dishes. I love World Market. I would buy a little of everything. I would get some of their enameled cast iron bakeware! I love World Market!! I would get a new table runner and maybe a small table for our patio. And I’m sure my husband wouldn’t let me get out the door without buying some new weird food. I’ve never been to World Market. Sure would be fun to see what they have. I would get somethings to decorate my patio. Absolutely amazing! I LOVE World Market, but I never seem to have a vision that comes together near that well or without costing an arm and a leg! I need serious lessons from you! I am OBSESSED with World Market as well! My love affair started when I purchased ramekins from them… and now I want everything in the store! I would LOVE a $100 shopping spree there!!! I would by a little of everything. I would love to win the gift card! Umm, pretty much anything and everything. I don’t have much so anything would be FABULOUS! I couldn’t narrow it down. A little bit of this a little bit of that! How great! I love your blog just bought your book and have made tons out of it already! Thanks! I had no idea what they had at World Market, but because of this post, I’m going soon! Love all the outdoor entertaining ideas! I’m with you on the World Market addiction. I love that place! They have the best ornaments and things at Christmas and Easter too. Woohoo! I’d love to try out World Market! I’d love to spend some money on new furniture for a new apartment! Thanks for another great post – I love your website!!! ps. it was great meeting you at deseret book…thanks for the fun evening!! I have my eye on those white, terra cotta rimmed dishes. Just something about terra cotta that makes me swoon! Thanks for the giveaway 🙂 LOVE your blog! I’m holding my first big BBQ in July and I’m actually taking my very first trip to world market at the end of this month so this would be AWESOME! I would definitely use a little bit on a lot of different things: baking supplies, tableware, food items. They have so much to choose from! Thanks for the giveaway! So honestly, I’ve never even heard of this store before now. It sounds amazing! I’m definitely going to be checking out the website. And there is no question about what I would spend the money on. It would be dishes, I’m obsessed!! I love love love world market! I go in the week before mothers day and decide what jewelry I want, then make my husband go back and buy it for me. They have the best variety of everything. I like to just to walk around when im having a bad day. I can’t believe I’ve never been to World Market. To be honest, I had no idea what it actually was. I had always envisioned it more as a Stein Mart, so I’ve never been interested. Your post has opened my eyes, Kate!!!!! After perusing their website for an extended period of time, I can offically say that I would use the giftcard for….I have no idea. There’s too much cuteness. But I did just move and am buying my first house, so maybe I’d buy some decoration items to spruce the place up. The bucket grills are so neat! They would be great for camping trips when it is too hot for a fire! Love your posts/blog.. and adore World Market just like you do!! I would love a gift card to spend on items for our camping trip.. I love little something to spice up the picnic table we have to use for 7days.. I would love a $100 gift card to World Market! They have some of the best wine, however I would to get my hands on some of their irresistible dishes!! Thanks! I would definitely spend it on furniture and those purple candle holders! Love all the ideas!!! Thanks for posting! I love their decor items so I’d get some art! I would totally buy new dishes. I’m in major need of replacing mine! I completely understand how you feel about World Market. I adore that store. I’d love some of their dishes or jewelry or placemats or food or furniture or etc. I have spent hours wandering that store. i love, love, love the world market. I am not sure i could pick one thing to spend it on. I would choose a pluthera of things 🙂 the chocolate section would definitely be on the list!! Yes, please! Definitely new table linens. Crap, I should probably mention that I want table settings and a globe. I LOVE that store too! I would use it to buy some of their outdoor lighting, their super fun kitchen gadgets and soon outdoor dining stuff too! What an awesome giveaway! I would definitely buy some of their delicious wine, try some ethnic foods, and purchase some of their beautiful dishes! Wow.. I have never even heard of World Market until today. I would love to buy some plates, food and some home decor. 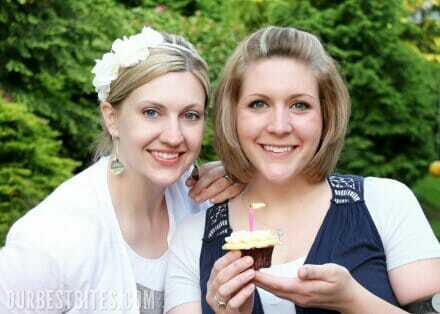 I love your blog and website. I’d totally stock up on all of the fabulous outdoor “room” goodies. This season’s yellows, and turquoise-s, and corals are almost too much to bear! LOVE! First off, your table looks amazing. And where have i been that I haven’t been to World Market. Oh Yeah, I live in SE Idaho. Not much like that around here. A $100 shopping trip would be amazing. wow! $100…i would definitely be spending it on items for our up coming wedding…i don’t know what exactly but maybe something for the centerpieces? or something else fun! I would love to use it on a little of everything!! Right now I am searching for small accent pieces. I’ve never been to world market…apparently I’ve been missing out!!! I’d probably stock up on some dishes. Those plates are adorable! I would buy some fun summer dishes! I need to add some color to my plain white dishes! I am sadly obsessed with cake stands, platters, and anything that can make a dinner party look amazing. I love the chargers and lanterns that you found! I seriously need to stop by the local World Market more often! Your table looked a.maz.ing! Your table is gorgeous, I love the colors! LOVE your set-up for an outdoor dinner party. WorldMarket is my favorite for little gifts, unique jewelry, and fun foodstuff treats. Our bedroom set is from there as well. I havent tried the things you posted in your pictures, but may grab some next time i stop by. YUM. Probably a little bit of everything…but for sure it would include some blood orange soda and black licorice. Our families staples whenever we make a trip there. Oh wow…I’d definitely do it on serving dishes and dishes! We usually eat out of pots and pans because I haven’t purchased anything to serve food out of! This must be a sign from God! I was seriously in the store yesterday when I found an item I had given up hope on! It was…Marshmallow Fluff! The one in the glass jar that just says “Marshamllow Fluff.” I have been searching everywhere for this stuff (yes, I know Kraft makes a brand too, but I wanted to try this one!) I had given up hope on this when Boom! there it was! So what would I spend the coupon on…yep, a bunch of marshmallow fluff to make marshmallow fudge, marshmallow frosting for my cupcakes, marshmallow fondant, and a jar just for dipping my spoon in! In addition, since Father’s Day is this Sunday, I would buy some really cool bbq seasonings and sauces I saw there too! This store is the bomb! Oh and did I mention I also saw cotton candy cupcake mix with cute pink sprinkles? I am a from scratch baker, but even this little box of cuteness piqued my interest so I would buy that too! I would buy some of the fancy syrups and make summery drinks for my friends! I love World Market and spend most of my budget there monthly! They have the best olive oil for the best price. Oh wow! I’ve never heard of World Market, but I’m already in love with their stuff! Everything looks so pretty for your party! I would buy new curtains and furniture to brighten up my home! I love, love, love World Market!They have great furniture, food, wine, dishes! It is definitely one of my favorite stores! Whenever I want something unique that is the first place I go! I would use it for lots of things, but definitely their jewelry and their Indian food mixes. I’d hope I’d be smart enough to spend it on patio furniture but knowing the love of Milka candy bars I developed on my mission…. We just bought new couches that are a completely different look, feel and color than our old ones…so I need a little bit of everything to accessorize make our open floor plan feel a little more cohesive now! I have been wanting a set of World Market adirondack chairs FOREVER! Thanks for the chance! I would buy food. I’ve never tried their food and now you have me interested in it! I love, love, love World Market! They are the best source for international food and cheap wine! I love the food at World Market. I’d buy lots of picnic foods. I love World Market. Would love to have this gift card to spruce up my kitchen/house! I think I’d want to buy a hammock and a hammock stand. Then you’d have to pry me off of it! I need some baskets for organizing all kinds of stuff in my house, and I love their large selection of baskets. And I’d probably get a few candles, too – Indian Sandalwood is the absolute loveliest! Do they still have those scone mixes? I might just buy $100 worth of those! I would spend it on new plates and place mats….anything to make my table not look so drab! Knowing me, I would spend it on food. I’m lame at decorating and making things looks nice, but maybe this would be a good chance to practice! LOVE this place!! I also love their unique foods and drinks. I am obsessed with dishes so I think they would be involved as well. I’d probably use it on furniture or dishes! I could definitely use some new dishes! There’s just something about eating a meal off fun dishes that makes it so much better than plain ol’ boring ones! I’ve never shopped at a World Market before, I would probably buy a little of everything! I was just at world market on Friday night…man I love that place! Their table linens are my fave. Living in Manhattan, I miss World Market and always visit whenever I’m home seeing my parents. I’ve been a huge fan of their serving ware for years. Pick me! no question, I would spend it on dishes…no such thing as too many dishes?! but I think I would have to throw in some of their fun food items too! I LOVE world market. If I won I would spend it on square dishes. I have been wanting square plates and bowls for so long! When I go to world market for something specific, I can’t leave until I have looked at the dishes. I also love to get the Australia licorice. I love the black, my kids love the strawberry. I would love to win that gift card, and I am pretty sure I would buy dishes as I kind of have an obsession with pretty dishes. This would be amazing! I’d probably use it for cute party stuff! I would probably get dishes, I love dishes! World Market is my absolute favorite! Thanks for hosting this amazing giveaway. I LOVE World Market! I would buy some dishes and a picnic basket that I saw there! Of course with yummy food from you website packed inside. 🙂 Yay! I would spend it on adorable dishes like you have displayed or even pillows! I could even buy some wall art! So many possibilities! Oh how I LOVE World Market! I feel like it has amazing finds for a much cheaper price than some of my other favorite wish-I-could-afford-them stores 🙂 I really want some kitchen chair cushions, like the Avani Floral Chair Pads I found this morning. The more and more pregnant I get, the less comfortable those hard wooden chairs are – ha! Love your blog…my husband especially appreciates all of the great food he’s been eating lately, courtesy of you girls! Thanks!! I would spend that money on a little bit of everything! LOVE IT ALL!!!!! I think I would use it for a little bit of everything. I could definitely use some BBQ supplies and some dishes. Thanks for the giveaway! Between your recipes and some pretty dinnerware from World Market, my mother-in-law will think I am a domestic diva when she comes to visit this summer! I would spend it on a little of everything, but especially dishes. I love World Market dishes! their food and cooking section. There are so many things on my wish list– a gift card would be wonderful! I love dishes and want some cool ones. I have nothing. Probably a little of everything. Love their stuff. I LOVE world market. It’s AMAZING. I love everything in that store from the food to the furniture. I think I would spend the gift card on some furniture for our new home! So hard to choose, but I really need a new rug! I too share your obsession with World Market. I could easily find something spectacular to spend that gift card on!! I need some new plates. My baby just dropped another plate today. I would like one set of dishes that matches for everyone to use. I know they sell individual plates; they have some nice ones! I love World Market! I would probably spend the money on new dishes! I would buy a little bit of everything! I have never heard of this place but found out there is one (kind of) nearby….this could be dangerous!! I *love* World market. I would use it to round out my every day dishes. I bought them at World market and need a few more pieces. Plus some food – I love exploring the fun food items. I am a World Market lover myself! I would spend this money on some new dishes for summer entertaining. I’m not a big entertainer, but would love to start. This would be the perfect way to get some fun serving pieces and dishes! Thanks for the giveaway! Just added you guys to my “Like” Facebook list! I need some cute new serving dishes. I think I could become addicted to this store myself!!! I just spent an hour looking at their website, I love it all! I think I would use the giftcard on the rotating sphere floor lamp for the nursery I am trying desperately to put together before this baby comes. But I also LOVE thier rugs. Thanks! I am in love with the dessert plates!! I would definitely be picking up some of them if I won! I would buy a little bit of everything for outside entertaining. Love the world market. I think most of mine would go to food, but also a little bit to some cute new dishes. Thanks for the giveaway. I would get some outdoor decor to finally make it feel like summer! Super super cute stuff!!! I would spend a $100 gift card on a little of everything@ World Market!! Its such a fun store! I LOVE World Market! Love all their food from around the world and “Crunchie” candy bars from England are my FAV! Yeah, you’re sister IS amazing. She cooked the most delicious-tangy salmon I’ve ever tasted when she was here last month. Hi Becca – happy birthday!!!!! Gorgeous table spread. . . I love World Market. Just thinking about it makes my mouth water for Swiss chocolate. Pick me! Pick me! Wow! I would spend the gift card on dishes. I think I found a new store to get addicted to. Oooh, I love World Market. They have beautiful stemless wine glasses and liter carafes that I would buy if I won the card. Great post and blog! Love to read it. I love World Market! We’re moving in the next couple of months, and that gift certificate would to to helping gradate our family from college-life household items! Curtains or bathroom stuff. I love World Market. I love World Market! Every time I go there I seriously spend an hour just wandering! I would use the gift card on food (the South African curries are SO GOOD) and some new tableware!! Umm, I cannot decide but it would be fun to have the option to make the decision. I love love love LOVE World Market!!!! I know I could spend way more then $100 but I would head straight to the kitchen gadgets and dishes!! They also have a buffett I would love to have in my dining room to hold those new dishes. 😀 Next, I would have to hit up the candle section and get some candles and holders for my patio outside. I would have to save a little something so I could pick out a cute dog toy for my Beagle puppy. He needs spoils too!! Love the candles! I would totally go for those (and the veggie chips!). Oh, how I love World Market. My mom, sisters, and I went to San Francisco to stock up, before it came to Utah. I would copy you, and purchase the chargers. I have a scary addiction to cute chargers. DIshes Dishes Dishes!!! Definitely… you’ve never seen a more mismatched set of dishes in all your life. I would definitely buy furniture. No plates. No one of everything! I would use the gift card to buy seat cushions or for anything outdoors. Jewelry! Just for me!! Pretty earrings or a bracelet!! I would definitely buy some decor for my new, and somewhat bare, apartment. I would just wander the aisles until something spoke to me (which often happens in that store). What a great giveaway! I love buying new dishes to entertain with! Definitely dishes and food…would check out the jewelry also. Love World Market! I’ve never been to World Market and I was delighted to find out just now that there are 2 stores in my area. I am definitely going to have to go!! I love dishes so I would enjoy spending some time getting lost in that department and I *so* enjoy trying new foods, so I’ll definitely be spending some time there as well. I love everything in this post. Starting with the plates to the votive holders. I am a total sucker for a pretty table setting, so that is what I would buy with a World Market gift card. I would splurge on everything kitchen!! They’ve got a wok I’ve had my eye on! I’d definitely use it for outdoor entertaining. We just finishd landscaping the backyard and I can’t wait to throw a party! I would buy a bunch of little fun decorator things I think, but when I go in there I’m always drawn to things I never knew I wanted but suddenly NEED! I’ve been dying to go to World Market. I would love to try pretty much everything in the food section! I love their wall of pillows at the store by us, so I would probably use the giftcard to buy tons of fun pillows to put everywhere through out my house…then I would also buy some of the fun food mixes, spreads and oils. 🙂 I LOVE world market! Definitely stuff. I love their stuff. Pillows and curtains and vases and decor. Oh and chocolate. I like their chocolate. French. Dutch. English. All of them. i would spend it on dishes! i love the dishes at world market, and i have a bit of a dish obsession. I absolutely LOVE World Market! Such a great place! I think I would use the gift card on home decor items-I could use some! Love the $8 lanterns!! I’d spend it on deco or furniture for my new house! I love their dishes. But they have a candy called malteasers…they are heavenly. Thanks. I’d use it on some fun food! I always drool walking through their food section. I’d definitely spend it on furniture. They had some cute black folding chairs that would be nice to have on hand. Then I could put the extra leaves in my table and sit everyone around it when we have guests. I don’t think I’d have a hard time spending $100 on some home decor items! I would use the gift card for dishes and some of the hurricanes you have on the table! I love candlelight!!! I love world market. I would use the card to by dishes or serving pieces. It’s all about presentation right! I found my first World Market store about ten years ago and it is one of my favorite places to go when I can get a babysitter. I can spend hours in there. By the way, if you don’t have a world market near you …some Bed Bath & Beyond stores have a World Market Section in their stores. I think I would spend this on new dishes! Thanks for the giveaway! I think I deserve to win since a) it’s my birthday this week, and b) you got to keep all the cool stuff I helped you pick out! Definitely food and/or dishes. They always have random stuff from Portugal or Brazil which obviously makes me jump for joy when I see it! I love, love, love World Market! The closest one is about 30 minutes away from me. And believe it or not, I was just trying to think of a reason I needed to go down there! I have so many things I would buy. 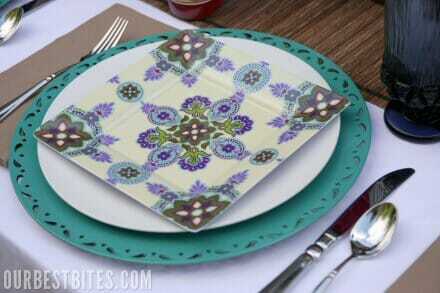 Pretty dishes, napkins, and there are so many foods I want to try like those veggie chips and Italian sodas. Yummy! I love all the European cookies at World Market. So yummy! I would use it to by a little bit of everything. So much to choose from! Love the spread! I am obsessed with World Market too. I love their Christmas ornaments…I have some of their furniture. If I won the gift card I would probably use it towards some new linens and serving utensils and maybe some of their treats. I think I would go with furniture. We just bought a new house and I want to fill it with everything from World Market! I would spend the gift card on a little bit of everything! Food, housewares, jewelry…I love it all! How can I choose what to buy? I guess I would have to say home decor. Hopefully something for a new house…. which means that I would be getting a new house! 🙂 But, really? Probably some toss pillows. I need to change up the look in my bedroom and living room, and that’s a quick, easy way! Dishes and table linens! I would love to pic up some fun new things for summer. I love world market. I would definitely spend it on their dishes. I need some new ones and have been eyeing some there! I love your table Sara! I would totally spend it on dishes and whatnots! I love to set a pretty table using candles, charges, different plates, etc. I think it’s so welcoming to your guests! I love dining al fresco but currently have nothing to do so, so I’d definitely get something for an outdoor summer dinner party. I would definitely buy serving dishes. I think any meal tastes better when served in beautiful dishes. I’ve always liked those big round seats they do…but dishes are hard to beat! Love the blog!! I’d use the gift card to spend on outdoor games for my family. We could use a croquet set and one of those huge Chess sets. Fun! I love world market. I never win anything but if I did I would buy some furniture for my very bare new home. Oh, I would have a hay day if I won! I have never heard of World Market but just looking at their site I can see an enduring relationship between the two of us! If I won, I would buy so many awesome things. I want the square white plates and the espresso mugs you have! Oh, and so much more! A few years back I found matching aprons for my little girl and I at World Market. They are super cute and I’m a little obsessed with aprons right now. So I would use the gift card on more cute aprons!! And on those adorable dessert plates that you shared! I would have to spend it on a little of everything! I have an outdoor birthday party I’m planning and I love all your ideas! What a fabulous giveaway! There is a World Market 5 minutes from my house and I have spent far too much money there. I’m always drooling over their table linens & dishes so that’s what I’d buy! Hot chocolate mix, vanilla beans and pots…..I love their stores. If I won the gift card, I would definitely buy some of those little votive holders, and then probably lots of pretty dishes and glasses! If I were to win, I would buy the beautiful things that you posted. I’ve always wanted to host a “women that inspire me” brunch and invite those in my life that do just that. We recently purchased a home that sits on a little over an acre of land, and I can just picture an outdoor brunch under our aged trees with a beautifully dressed table underneath. Hey…it could happen! That’s a hard one – love the look of their furniture, but I would probably use it on dishes. I would spend it on food and dishes definitely….probably mostly food! 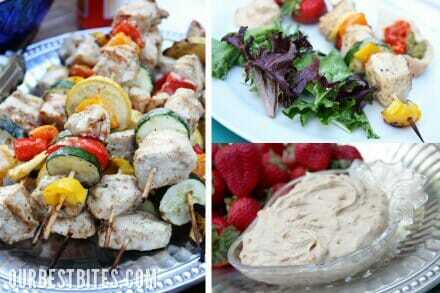 I would definitly get a little bit of everything for a summer party! A little bit of everything. Dishes, candle holders, food…I love World Mart! My husband and I LOVE World Market… they have a great Dining Sale Event every year just before Thanksgiving. That’s where we scored our dining table and chair set! Now we just need a good set of white dishes! A little of everything! LOVE World Market! I would love $100 of money to spend on ME! Every dollar I ever have in my pocket goes to the kids (or family) – I’d love a free for all of things MOM loves! Thanks for the chance! Dishes I could use some cute summer ones. i would probably spend it on the food! please enter me in your give-away for the $100 world market gift card, thanks! All I can say is that I absolutely love your website, and all of your receipes. I am always trying to find new receipe and ideas, and I don’t need to look any further. I L.O.V.E you two!!! I love world market as well, and I have few things from there. I would love to get some new stuff for my backyard. I too, love sitting outside in the summer with candles lit everywhere. There is nothing better than summer. I would love to have the gift card so that i can make my plain back yard into something special. Thank you again for everything. I bought a cook book for my mom, and my mother-in-law, and we all love everything in it. I just wish you could come to Vegas so I can get it signed. Thanks again for all of the yummy stuff. Everything looks so cute! I would buy some of those adorable lanterns and the Italian soda (YUM!) and some food and some plateware if I have any money left! I would buy something for the home. There is so much to choose from. I have never been there. I just have seen their ads in the paper. But it was a very bad thing for me to look at their website. Some amazing prodcuts. I would definately use it to get those adorable chargers and vases for the lights. Plus that artichoke spread looks pretty darn yummy! I would use it for dishes galore for my newly redone patio! What a fun party! I think I’d use the money on dishes. I keep hearing amazing things about World Market- and I’ve never been there! Now I’m thinking I need to go explore… I would probably buy cute entertaining supplies, dishes for a crowd and big serving bowls to replace my old college ones. Hooray! So so so fun – the party looks amazing and the table turned out gorgeous! Love that store! If I was the lucky winner I would spend the money on outdoor entertainment 😉 What a great way to start summer!! I definitely would use it to buy dishes…like the plate set you used in this post or serving dishes. I would definitely use the card to have an adults only party. love my kids but i need some fun time with just people my age. I would love to buy a little bit of everything (but I’m LOVING those dishes!)! I would definitely use it to buy a ton on fun things for my kitchen! Yay! I love World Market too, and would LOVE to win the gift card. I would spend it on some of the stuff you bought. I love the chargers and votives, and I think it would be so fun to host a summer party with them. Thanks for the chance. I would definitely buy some new dishes! I need some outdoor dishes desperately! I was just there this weekend and saw a rug and some candle holders that I would love to have. I’d like to think I’d buy home decor or those super cute dishes; but in all honestly I’d probably use all the money to stock pile on Arnotts cookies? Mint Original and Caramel. Ever had those with hot chocolate. Holy Crow! One bite and you’re hooked for life. Mmmm… yum! I would definitely get some wonderful stuff for my kitchen! Ooooh – I could really use that for some new glasses! Oh and I would definitely get dishes! can’t ever have enough of those! I think I would get some fun dishes?!? I would love some new dishes, in fact, I’m in dire need. I love that plate holder you showed too! Oh I love that store! I’d spend the giftcard on some fun pillows or some serving dishes. Or a set of dishes. Or some outdoor stuff. Or some cooking spices… LOVE it all! I love their furniture, but some new summer plates would be a nice addition! Thanks! Dinnerware. Loved the Amber dinnerware set. It’s about time we replaced our sad collection of plates and bowls from our college days. My backyard deck is in some serious need of some love so that we can enjoy it all summer long! Thanks for the giveaway gals! A little of everything! I think I would mostly spend it on dishes, though. I love what you did! So beautiful! Thanks for sharing all of your awesome recipes. Cooking has become fun again! YOu are making me look great. My husband can’t get over the coconut rice and play dates are a breeze with edible play dough and slime. Thanks for sharing the fun! I would use it on a little bit of everything!!! I am moving– I need the gift card for all sorts of reasons, but mostly to decorate my new home! I would buy tableware. Mine could use a pick-me-up! What an exciting giveaway! I’m really impressed! If I won the gift card I would spend it on a brand new couch! We really need one (and have been looking for one for months now) so the extra help on the new furniture would be GREATLY appreciated! Thanks! Love everything! But I REALLY need some new plates. I love World Market, I would love to use the card on any kitchen supplies including plates, cups, silverware… actually the more I think about it I would have a tough time deciding what to get. I love everything there! Oh, definitely stuff to decorate my table. And stuff to make bows for my daughter’s hair. And candle stuff. And maybe some of those blood orange drinks you posted… yum! Yeah, I would have a really hard time deciding. I would spend it on a bottle of wine and a cookbook. Two of my favorite things! Oh, I LOVE World Market. No telling what I’d spend it on. Probably cute dishes or kitchen gadgets. My husband is addicted to this candy they sell called Hi-chew. It’s fruity, it’s chewy, it’s delicious. I would definitely stock up on some of that, and probably hit their wine selection also. I would use it on dishes and entertaining items. I am so in love with World Market!! …and $100 goes a long way at their store, also a plus! Some things I love their right now are their cute summer dresses and I love all of their jewelry options. I love the shower curtains and all of their bathroom stuff. This is an awesome giveaway, thanks for the chance to win! I’d like to say I’d buy dishes and I would certainly look, but I would probably spend most of it on food. I love trying new and different foods. Maybe some cute table linens or coverings too. Who knows! Sounds so fun. What a beautiful party! I love World Market! All the home decor and dishes are so pretty and whenever I go I always bring home all sorts of tasty treats! I don’t know that I would know where to begin at Cost Plus but I LOVE the votives and all the cool teas and seasonings and unique foods. The rugs at World Market are so wonderful. The colors are inspiring. I would use the giftcard on fun dishes for entertaining. Sooooo cute!! I’d use the gift card on some cute dishes! I would get dishes!!!! We are using the hand me downs from when we first got married…but our oldest sometimes tries to “flip” them while setting the table. And he’s 3. So we’re down a few necessities! Love World Market almost as much as you. I would be like a kid in a candy store….probably couldn’t decide where to spend it although I am particularly fond of their selection of kitchen and dining supplies!!! I *LOVE* World Market! It’s one of my family’s favorite stores. Everytime we go we spend at least an hour there easily. If I had the gift card, I would use it on some of their cute dishes, food, and some of the sweets. I would love to pick up some big, colorful serving platters! Oh I hope I win. I LOVE World Market. The colors are so fun and fresh! I think I would use a gift card on some new dishes & fun kitchen accessories. I would use it on party decorations and elements to make a beautiful, simple table! Your party looks like it was absolutely amazing! So Beautiful!! If I were to win the $100 gift card – I’d use on table decorations for my wedding next May 🙂 Specifically those purple vases you found, love them! I love World Market! I always find something unexpected there. I could totally use some dishes for using outside this summer. I’d love some of the colored outdoor string lights to hang around our deck! I love their chinese lanterns and hand made cards! I LOVE World Market!! I would use the money for tea, chocolate bars, and a new rug. I want those candle holders! And jewelry…and a scarf…and tea towels…and a picture frame…and my kids love the candy there…the list is endless-Thanks! My office is so boring and I hate being in it 8 hours a day! I am looking at redecorating it and making it into a brighter happier place in hopes that I will enjoy it more. I would use the gift card on rugs and stuff to help in my office! I love your outdoor table! Great colors! If I won the gift card I would buy items for my sons going away party! Appys, plates, and cups! I LOOOOOOOVVVVE their dishes and napkins!!! I would use it to get some fun stuff for my kitchen. Definitely on entertaining!! Love all your pictures! If I won the gift card I’d have to get one of their awesome colorful Adirondack Chairs!! They are so beautiful, everytime I’m in the store I can’t help but take a seat. I need a new rug for inside, so I would use it to buy one. Definitely a little of everything, but I love their paper lanterns and the huge selection of Torani syrups to make into fun drinks, snowcones, etc. I’d definitely spend it on dishes and tableware. I have pretty boring plates and hardly any table decorations. With 5 kids, I’ve overlooked style in favor of utility, so I’d love to spice things up a bit. I just moved to a new city, in a new state, and bought a new house! I NEEED EVERYTHING! And, there’s a WORLD MARKET just down the street that I’ve NEVER been to! I gotta win that gift card so I can go check it out! dishes and decor for sure!! Loved your table spread! I would spend it on kitchen supplies and food!!! Looks so good! If I won the gift card I would use it to put on a fabulous backyard bbq like you did. I have always wanted to do that! I’d spend it on home decor and maybe of those huge handle holders you picked up for the new patio! Ooo I’m getting excited just thinking about the possibilities! Oh, a little of everything, definitely! I’m as obsessed with that store as you are, but I’ve only ever had the money for some small food items. My family and I have just finished our yard and I would LOVE to throw a party! I would buy some fun outdoor decorations or put it towards some outdoor seating. I think I would spend it on dishes! I love dishes!! I LOOOOOVVVVEEE World Market!! If I win I want to deck out with outdoor picnic supplies so I can take my cute new family out a million times this Summer. Picnic blanket, picnic basket… they’ve got everything I want. Plus they have this awesome Red Take-Out Baker and Insulated Carrier for only 2.49! I want 3 of them! Oh I love World Market! I think I would buy a little bit of everything! Especially the dishes and jewelry! How fun! Such a pretty party! I would definitely pick up some of their gorgeous tableware with that shopping spree!! My husband and I love World Market! We spend at least an hour in there each time we go. I’ve been needing new dishes for years and have been eyeing a set there for awhile, so I’d definitely use the gift card for that! I would it spend on anything that sparkles or shines. Everyone now and then needs a little “bling” in their life. New table linens, I love the patterns they have there! Dishes and table accessories, please! I love having basic dishware and then accessories that can be used to mix and match for all occassions. I love that store, could spend a whole day there. I used to eat violet flavored candy as a kid, and I have found it there also. I really love to entertain and cook and you gals are such an inspiration! Love everything you do! World Market. Such temptation! I would stock up on party supplies and dishes etc for outdoor entertaining. Thanks for an awesome giveaway! I love World Market too. My husband is from Australia so I always get treats from home for him…Bundaberg Ginger Beer and Tim Tams! We also like their tea and coffee. I love to check out their holidays items – cute stuff! I think I would get a little bit of everything. I’d probably just spend hours looking at everything making list after list after list of everything I loved and then finally have to make some decisions. Everything looks wonderful there. If I won I would use it for a new dish set. My brown set is getting so boring, I need a colorful one! I would spend it on food, food & more food! Oh, I would definitely spend it on new white dishes! I wish I had a World Market close to my home! I would totally get some cute summer tableware for my outdoor BBQs! I love World Market. I would use a gift card on supplies for my upcoming wedding! We’re doing it on a budget with a lot of diy things. My first reaction would be FOOD of course, but I don’t know… those dishes are pretty darn CUTE!!! Love me some World Market! I’d use the gift card for dishes – ours are broken! I also really like the World Market, and if I won, I’d definitely buy the serving dishes (or a little of everything… =D). If I won I would use it to spice up our patio! Gorgeous!! All of it. Including the two of you! I just hosted a get together this weekend and realized that I am in desperate need of serving bowls and trays, so I’d go nuts in that section. I LOVE World Market and could really use an outdoor entertaining set – you know, cute dishes that look like they were supposed to be used indoors 😉 My daughter’s bday is coming up so that’d be so so awesome. 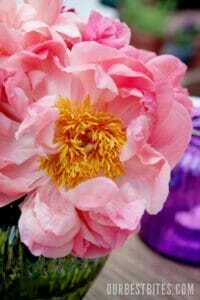 BTW – loved how you decorated with peonies. I love them and am so excited that my plants are really taking off this year! I would buy dinnerware for our Calvary Mission School where we feed 45 kids three times a week! I would use it for the beautiful jewelry -styles from all over the world, and of all of the yummy food and wine imports… YUM! I would by dinnerware for our Calvary Mission School where we feed 45 kids 3 times a week! I love world market! I haven’t been there in years, but I remember going there when I was young (like in junior high) and buying monkey things. They always had the cutest little collectibles. If I won the gift card I would probably use it to buy decorative things for our home. I don’t have any currently because my two year old has broken everything I had. I would buy cute things that could be child proofed. I would love to spend the money on party supplies for a back yard party. We have a couple coming up this summer (the mil 50th & son’s 1st). It would be awesome to shop World Market for supplies. I would definitely spend it on outdoor tableware! PS–I made your baked chicken taquitos last week and they were fantastic! Thank you! Definitely dishes. You can never have too many decorative dishes! What WOULDN’T I use a gift card for? 😛 We just moved and my list of wants/sorta-needs for setting up this new house is HUGE (and was written with WorldMarket in mind!) For starters, we need a new dining room table and chairs, and then new place settings to dress it, curtains for the giant window in my new living room, and I could really use some new throw rugs (our new house has wood floors everywhere.) I would LOVE to win this gift card–part of the perk of moving is that we left the boonies and now live where we actually have great shopping options like World Market! I want to get those candle holders! Love them! I too LOVE World Market! l would use the gift card on those delicious Italian sodas, the beautiful jewel colored candle holders you used for your table setting and some new outdoor serving pieces. I would absolutely love to win this card. I would probably have to buy a little of everything with it. I have been a follower for some time now and have gotten all my friends to buy a cookbook. Now when we all come to work (I work school luch at an elementary) we all tell eachother which new recipes we have all tried. I have also gotten the cookbook for my kids so they can take it into their marriages. Such fun and beautiful recipes. I love getting the email 3 times a week telling me that there is a new post and I rush to see what it is. Thanks for all the brilliance. Would have loved to catch you at Orson Gygi but it was filled so quickly. I love World Market! I could decorate my whole house from just that store alone! Wow, what a beautiful party you put together! I love those chargers so if I won the gift cert those would definitely be on my list…but I would also buy some home items like rugs since we just moved to a new home and need some new rugs for all the wood floors! Thanks for the chance to win! 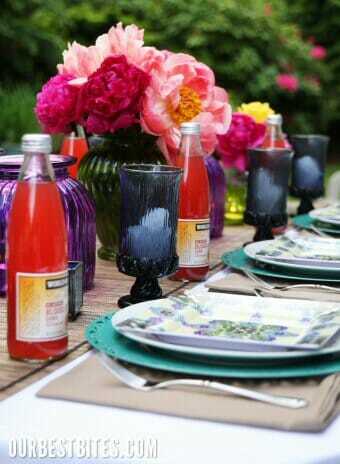 Things to brighten my summer entertaining table! It’s so hard to pick! Cute new bedding? Serving pieces for entertaining? Bathroom decor? Save it for gifts? I could easily spend $100! Three words… Bulldog Root Beer! When I lived in Utah I was introduced to Henry Weinhards Root Beer and it was the absolute most awesome root beer. But when I moved back to Louisiana… no Henry anywhere. Nor could you order it online. So upsetting. Well, luckily for me, I discovered Bulldog at the one-and-only amazing World Market and it tastes ALMOST identicle to Henry. (The closest I have found.) So now everytime we go to Houston or Baton Rouge, “almost Henry” here we come. So, that is what I would spend $100 bucks on. A complete “stock-up” on Bulldog! 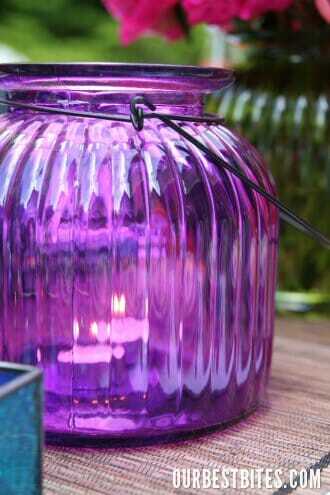 I love the large purple votive candle holders! Their things are so beautiful! I would love to win the gift card, and thanks for offering it. Oh gosh, I have no idea! I love that place, too. Probably a little bit of everything. I’d put it towards a new kitchen table. Ours has been used and abused by small children and I think she’s due for a much deserved retirement. It’ll take a while to decide. Wow! Where to begin? Mostly, I would like to use this card for kitchen “stuff”, food, tableware……… I love it all. I would use the gift card on some cute dishes! Love! Would defenitely have to snag one of their great canvas prints with the motivational quotes! Have the perfect wall for it!